Kingston parking meter with inexpertly but cost effective sign taped to it. I have been an organizer with the Halifax Pop Explosion music and arts festival for a while; our office has been on Gottingen Street for five years. For two years, we helped the local merchants association organize the North End Community Fair. The street festival took place on Gottingen Street the first Sunday of September. From Cunard to Cornwallis, traffic was re-routed for a day so the neighbourhood could enjoy a family-oriented street party. One longtime community member describes it this way: “It is the one time of year where this street is about the people who live here and not about cars.” Closing the street gave the neighbourhood a sense of ownership and control. But as we discovered, closing a street isn’t as easy as you might think. At least not in Halifax. It can be as simple as walking and putting out a couple of orange sawhorses. That is how we did it in 2006, when the manager we needed to speak with at HRM was on vacation and a junior staffer decided that would be okay. In 2007, HRM charged a pittance to close the street for us. In 2008, we applied to have the street closed on June 7, eight weeks out from the proposed event. Five weeks later, HRM got back to us, telling us the service would cost $916.95, taxes included. We learned that about $200 of that was to put up “no parking” signs on Friday—that left almost $800 for the sawhorses. Four of them at each end of the street. Eight in all. One hundred dollars per sawhorse. We were stunned. So I started asking questions and over the next three weeks, the email flew. In the meantime, I got an estimate from a private contractor, willing to provide large reflective barrels, sawhorses with flashing lights, signage and traffic-control officers for both affected intersections. The estimated cost was $360. That idea went nowhere. By the end, we were arguing our case to chief administrative officer Dan English and his deputy Wayne Anesty. Our councillor and Mayor Peter Kelly were in on the emails. Management blamed union rules. Officials claimed that they had to have HRM supervision, at our expense, even if we hired a contractor. Risk management. Insurance. Standards. Professionalism. Certification. We gave up a week before the event and accepted HRM’s rules. Two HRM staff came in a yellow truck and chucked out eight $100 sawhorses. They came back nine hours later. For those 20 minutes of work, we paid a bill of $800. We didn’t do the fair in 2009, and probably won’t this year. I realized that HRM’s staff was just following the rules but that doesn’t mean these are the right rules. No one was willing to discuss changing the rules. No one would tell us how they developed them. No one could (or would) provide a written copy. It was just the way it was, and I was an ignorant civilian who did not know what I was talking about. Last summer, I drove to Ontario to visit my family. 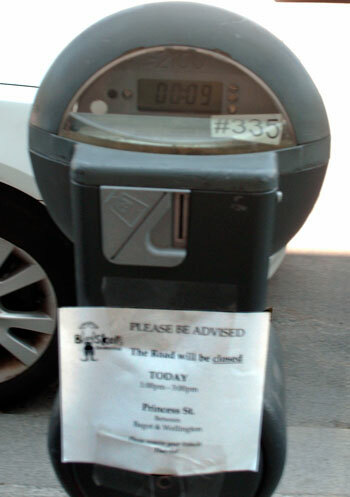 As we strolled in downtown Kingston after lunch, I saw a sign taped to a parking metre on Princess Street, one of the city’s busiest downtown streets. There were no city workers in sight.